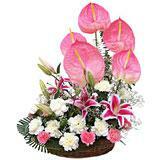 Convey your words of love and care through flowers. 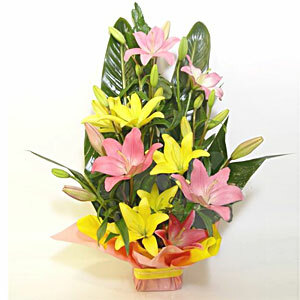 Presenting herein a nicely decorated bouquet that showcases an exquisite collection of beautiful Yellow & Pink lilies. 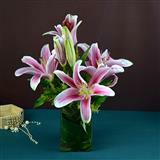 The basket includes - 2 stem of Yellow Lilies (2*3= 6 flowers), 2 Stem of Pink Lilies (2*3= 6 flowers) in a basket decorated with big green leaves. 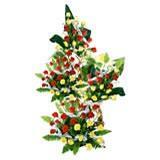 Elegantly complemented with greenery, this bouquet is sure to charm your dear one. 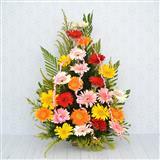 Send this floral arrangement to all cities in India on any day through GiftsAcrossIndia.com and ferry your honest wishes and delight your friends and family all the more. 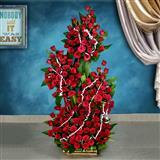 Since 1999, we have formed a separate niche in delivering your Gifts across India with utmost care, dedication and promptness.